The gates are up at Woodstock, the first grade crossing in quite some distance. 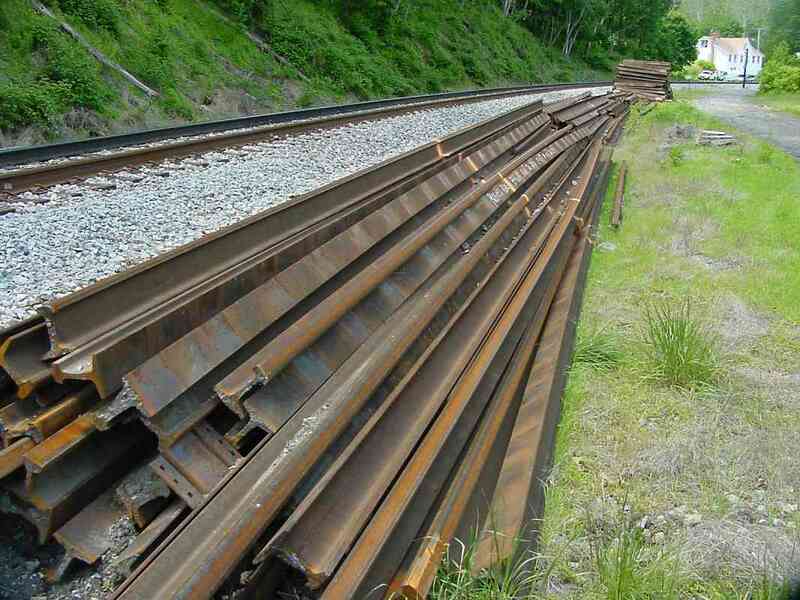 CSX was performing track maintenance during the summer of 2000, hence the ties and supplies you can see stacked here. Those supplies are roughly at the location of the original Woodstock Road grade crossing. 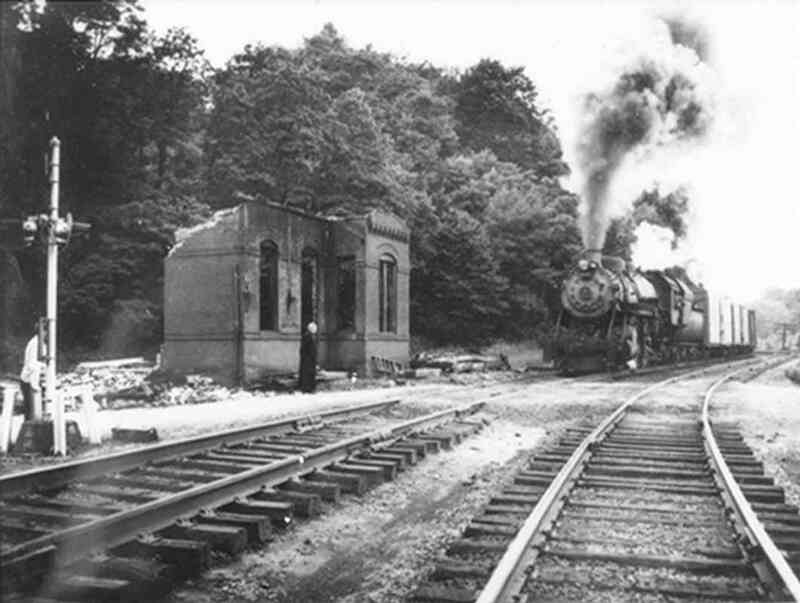 The B&O had a surprisingly large station here before a fire during the 1940s claimed it; the ruins were torn down around 1953. Had the station still been present the tree shadow at photo bottom would have been cast upon it. 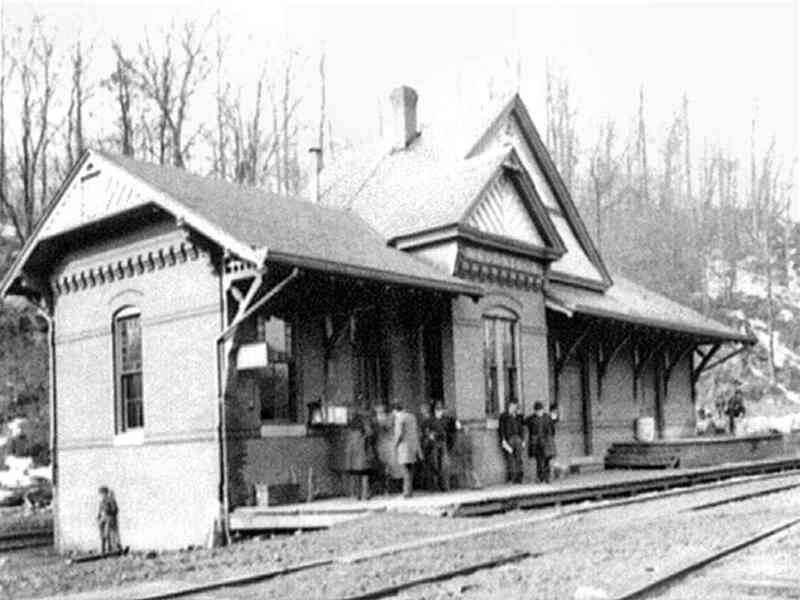 The 1884 Baldwin-designed station resembled the surviving station at Sykesville, which will be seen later in the tour. 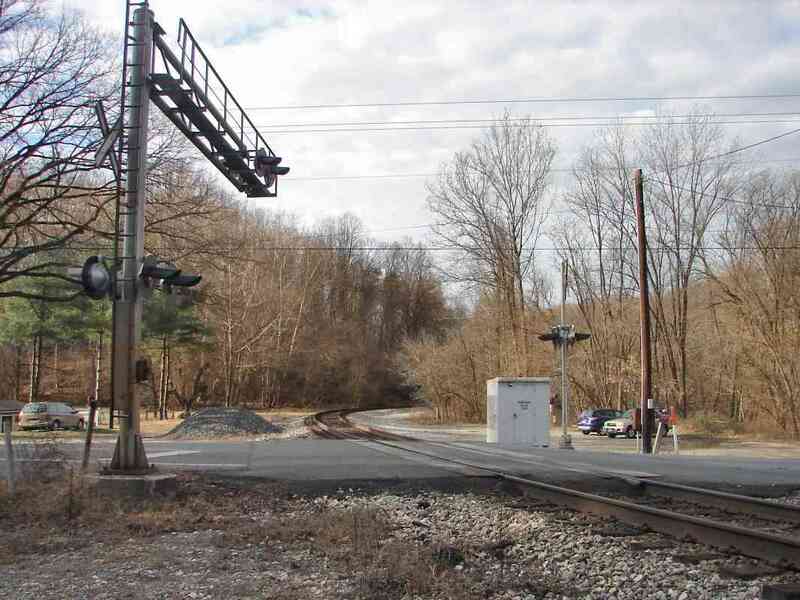 At the time of this photo, the photographer was standing at the Woodstock Road grade crossing. The old road turned west then decended to a bridge located about 500 feet upstream of the present-day span. 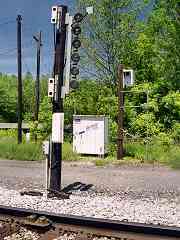 These signals were new at the time of the photo. These bridge remains just west of Woodstock look like they might have been for a railroad spur, but they are actually the former Woodstock Road bridge. The bridge was replaced around 1981 by one a short distance downstream (east), but the ADC street maps still show the old configuration. 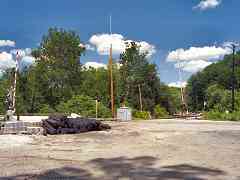 "I want to comment on the Woodstock Road entry, where you are showing the stone remains of the old bridge supports. I grew up in Howard County, and as a kid in the 70s we used to travel to Granite regularly to visit my grandfather. I'm guessing it was the mid 70s, and the old bridge had been washed away by Hurricane Agnes. You could still see the twisted remains of the bridge in the river, as I recall, and there was a single lane temporary military style bridge crossing the river. I remember being scared of crossing that bridge, with the thunking of the wood deck under our car as we passed, and that it was a strictly one car at a time bridge." The view above looks across the river from the Baltimore county side while the small, old picture at the site linked below looks toward the Baltmore county side. 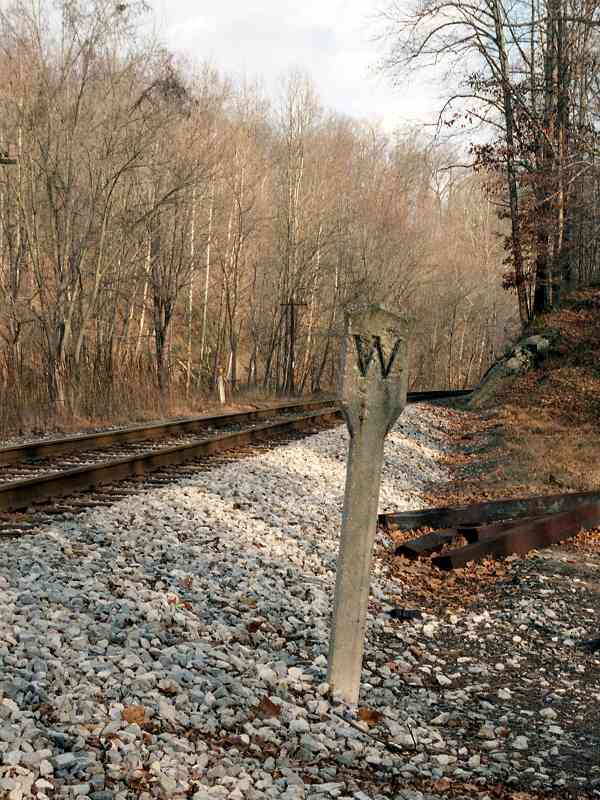 Looking back to Woodstock shows the west end of the two-mile-long siding that began west of Davis Tunnel; the railroad calls this location "W.E. Davis". If these tracks appear perched on a shelf it is because they are. The original alignment had swung to the right, further from the river. A short distance west of Woodstock is where you can find this substantial arched stone bridge. The mortarless construction had fooled me into thinking this was a circa-1830 original, however... see the next photo. These crumbling remains suggest this had been the original bridge. By rebuilding closer to the river the B&O eased the curve here. I estimate the work was done about 1838 with other similar realignment efforts in this vicinity. An old B&O train schedule says the "Maryland Spar and Flint Company" was once located near here, but I could find no remaining evidence of it, unless these stones represent a siding. I doubt that is the case, however, since sidings are usually placed where they do not require construction of a separate bridge. The ballast tamper stops here! 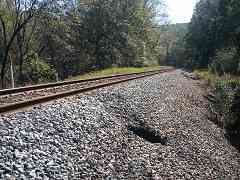 If you look closely, you can see evidence of recent CSX track maintenance here. In the foreground the ballast is correctly tamped into place (you can see the ties). A little further in the distance the ballast is scattered over the ties. This is where the ballast tamper machine stopped. Further ahead new ballast is heaped in the middle of the track, where it has been dumped awaiting tamping. Sharp-eyed readers might notice the red spot that seems to be perched on the tracks immediately right of the telephone pole. That's actually a Scarlet Tanager sitting atop a tall, dead weed stalk. 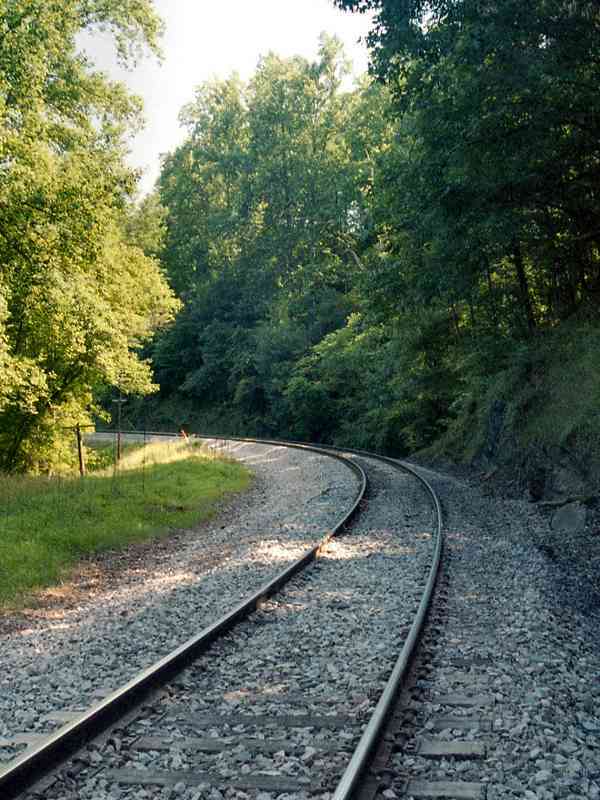 Thanks to the nearby river and quiet of the Patapsco State Park, this is an excellent area for those who are into bird watching as well as train watching. 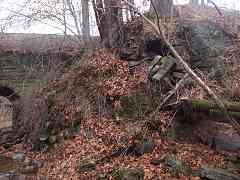 Part of a culvert below has collapsed allowing fill and ballast to funnel down. 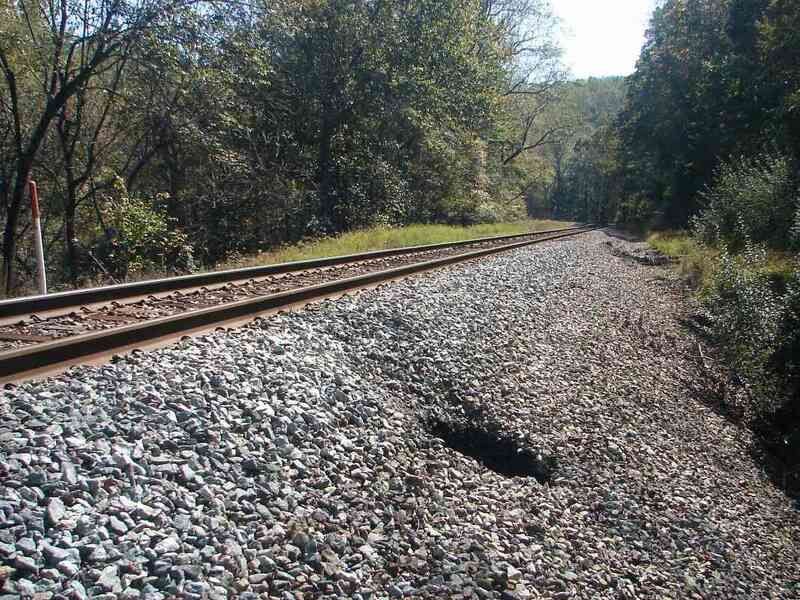 I suspect CSX put a priority repair tag on this before it could expand and undermine the rails. 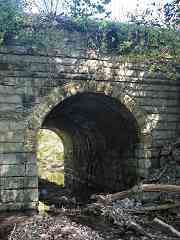 Here's a closeup of a smaller arched bridge, this one located just downstream of the forks of the Patapsco. The sharply hewn stones and lack of mortar point to an original circa-1830 bridge. 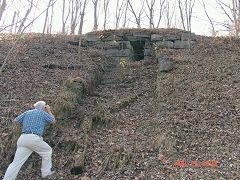 Ziggurat is the name that pops into my mind when I see this interesting stepped culvert discovered by Dave Hiteshew and dad. The segment between Woodstock and Marriottsville has plenty of attractions for the arched bridge fan. This third one is unusual in that it sits deep in a pond on the downstream side. The tracks can be seen above. In his book The Great Road, author James Dilts tells how the Irish laborers, who around 1830 were building the track in this area, went on a rampage when their pay was delayed yet again. In one night, they managed to destroy all the track they had built from here to Sykesville, some 5 miles west. In what was the first troop transport by train for military purposes, the Baltimore militia was called out on that rainy night, and slogged the last five miles to Sykesville on foot to quell the riot. In the end, the B&O paid the workers for both their initial 10-months of work, as well as the cost of rebuilding the destroyed mileage. If you took the detour, you learned the B&O's original alignment bent to follow a Patapsco River kink. Before the railroad's first 10 years had elapsed, to straighten the tracks it diverted the river into a cut on the right, thereby creating McKeldin Falls, and added the fill seen here over the kink. Unseen on the left behind trees is the 1830 original alignment. 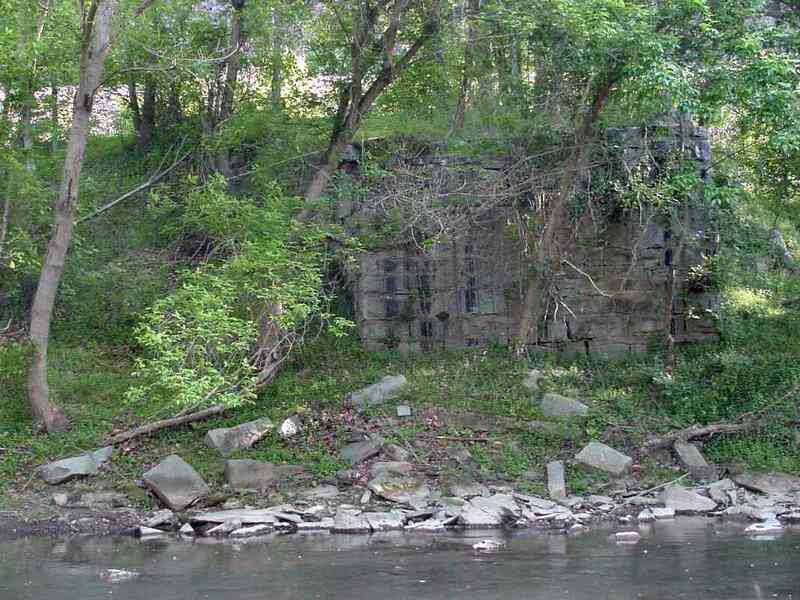 This is the only location in which the B&O rerouted the Patapsco River. As we approach Marriottsville (and its former post office, the white building at the grade crossing in the distance) the width of the clearing reveals the past existence of one or more sidings. 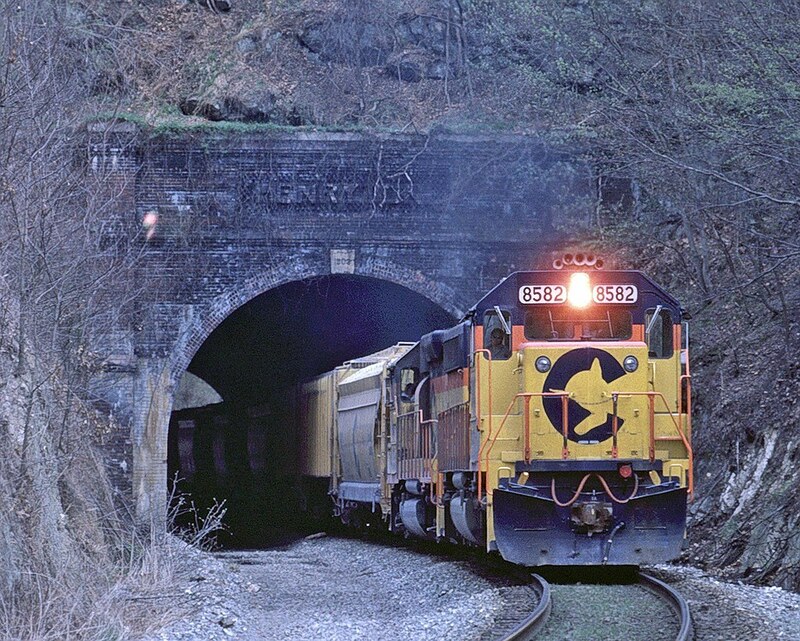 These days CSX often temporarily holds supplies or scrap here. 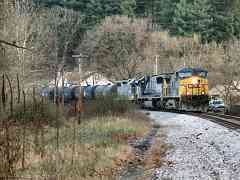 CSX 835 and CSX 3137 drag coal through the Marriottsville Road grade crossing to the port of Baltimore. Just east of the grade crossing was an installation of CSX's On Track system. It is no longer extant. 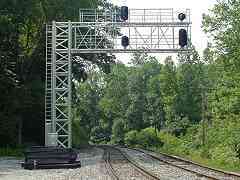 "I've been told by a CSX engineer as well as another railfan that the detector at Marriottsville is a photo detector. The device has lights so that its photo cells get decent amounts of light no matter what the ambient light. 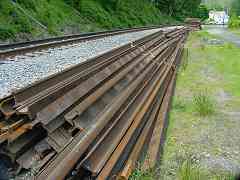 Evidently it transmit it's photos ahead to the yards along the line yielding a photo book of the cars in the consist. The photos are evidently good enough to make out numbers and bar codes. My friend has evidently seen the pile of photos it transmits. I've witnessed numerous trains at Marriottsville and never picked up and audible detector announcement on my scanner." 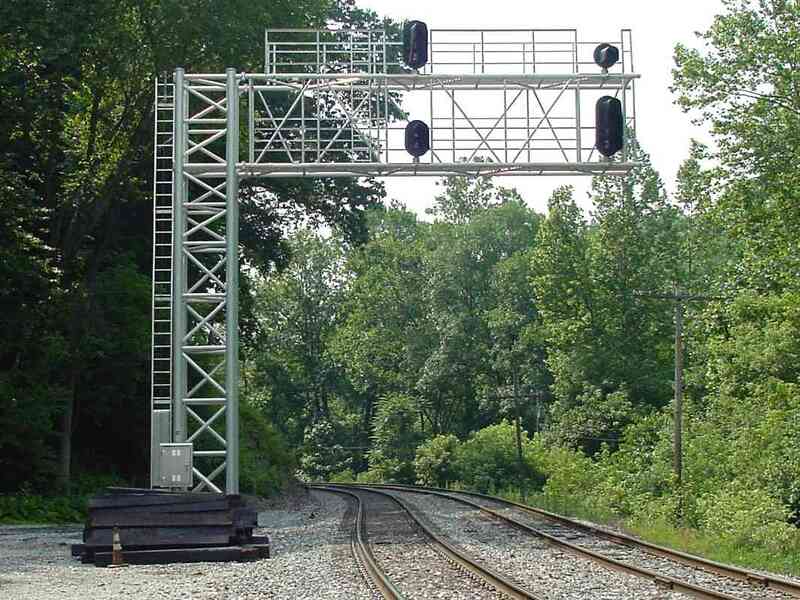 "I used to work for CSX and know about the 'On Track' system at Marriottsville. If a car's AEI tag cannot be read, a photo of the side of the car is taken and transmitted to Jacksonville, where an operator sits at a PC and manually enters the number. Some of the train crews actually duck below their engine's windows when they pass this camera, convinced that 'spies' in Jacksonville are taking photos to ensure compliance with safety regulations." "Just thought you might to have a little more information. 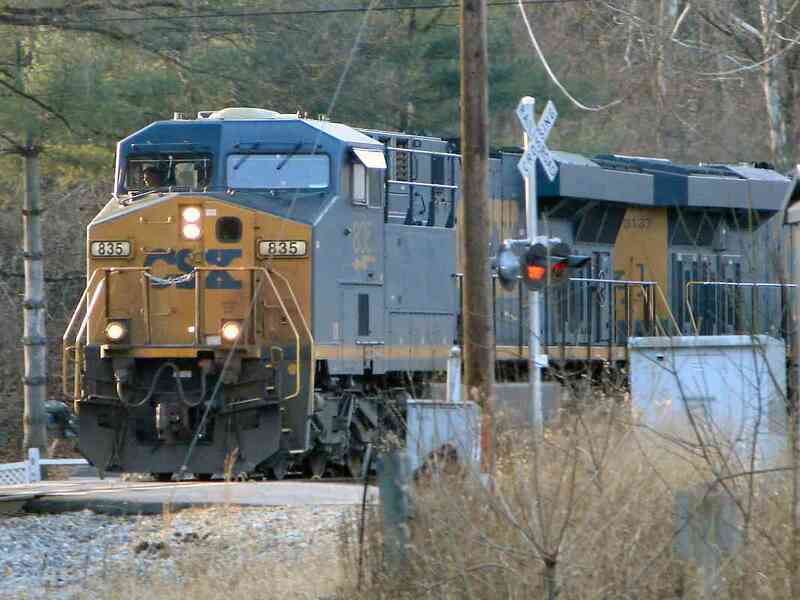 What you photographed is a 'video reader' as CSX calls them. They take a video of trains passing in either direction. This video is them sent to Jacksonville where the work orders are completed on each individual train before it starts it next move. With these videos the clerk's here in Jacksonville can see if there were any 'add cars' that the train might have picked up while it was enroute. One problem with these readers is that sometimes they tend to malfunction, because of weather or vandalism. 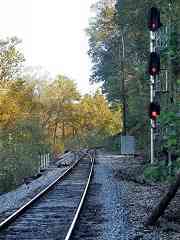 One image that was captured in the Narrows in Cumberland was some deer crossing the tracks within range of the motion detector which starts the video and lights coming on. The lights at time would come on for no apparent reason therefore needing bulbs to be replaced. Now the locomotive passes a predetermined location with sensor to trigger the lights. When locomotive and consist is within a predetermined range of the motion detector then the video starts rolling." "The Automatic Equipment Identification & Video in your photo at Marriottsville is now out of service and will be removed. A new Automatic Equipment Identification (AEI) building and antenna system has been installed at the same location. 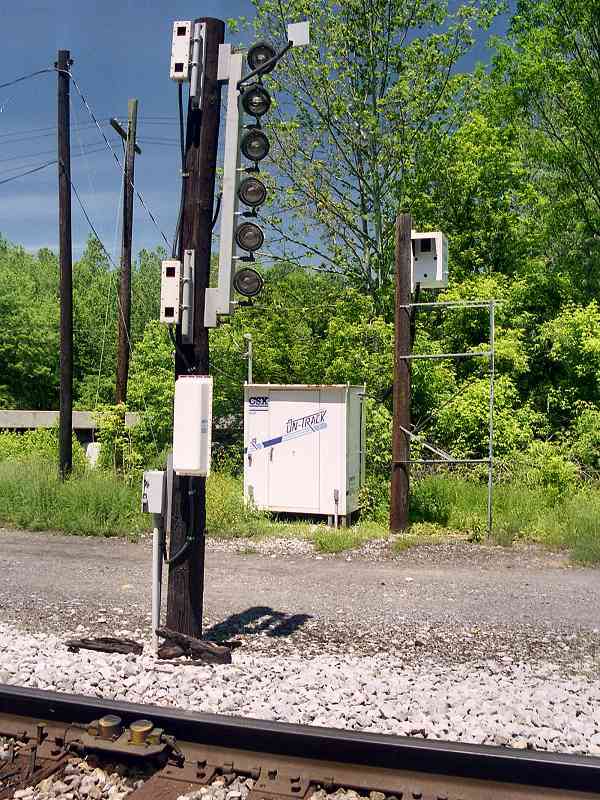 The equipment reads the information on the tags that are located on the locomotives, cars and on the EOT device. It also records the speed, axle count and the direction of the train. There is no audio announcing the train moves." 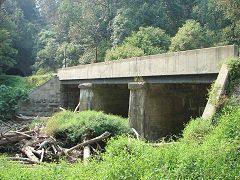 The Marriottsville Road highway bridge is the concrete structure in the background. 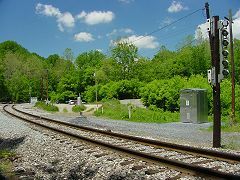 Five years after the prior picture, the On-Track equipment is still present, but has been superceded by the Transcore system seen in the trackside "planter" at left center. Transcore watches for on-car radio-frequency identification tags. The Marriottsville grade crossing is in the distance. Previously, this one lane bridge had sufficed to carry Marriottsville Road between Howard and Carroll Counties. 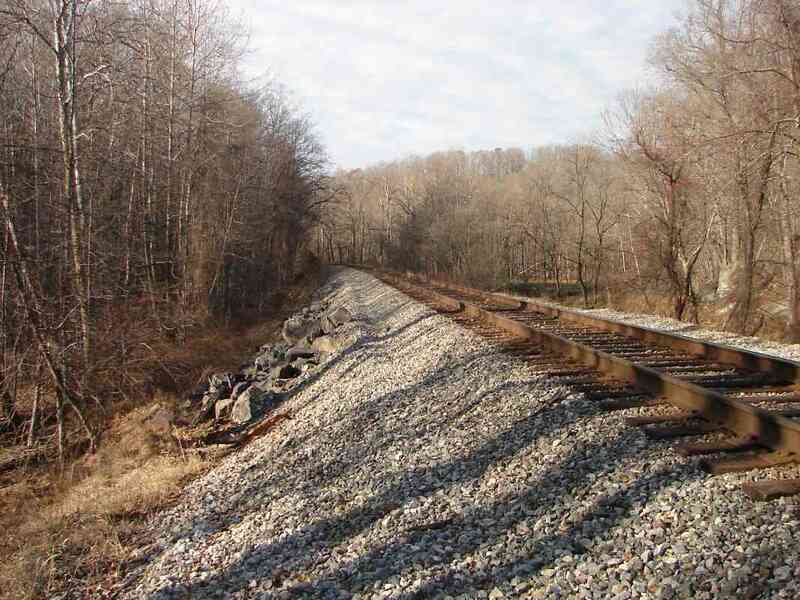 The width of the clearing, and a bridge beyond, suggest one or more sidings had also existed west of Marriottsville's grade crossing. A brief scene with Clint Eastwood was filmed here for the 1997 movie Absolute Power; these grade crossing signals are visible, but no trains. "When I was a pre-schooler, we lived on the Ivy Hill Farm on Driver Rd. above Marriottsville. One of my very early memories is of a train wreck at Marriottsville. I can remember seeing the steam engine where it crashed through the back wall of Mrs. Gates' store. This must have been some time in late 1943 or 1944. My parents always said that the derailment was thought to have been sabotage. Another item about the B&O and Marriottsville concerns several widows living there during this period. My mother told me that the B&O furnished coal to these ladies by way of the firemen on passing trains. The children in the community would gather the coal from along the tracks for these ladies. I have enjoyed looking over your website." A series of tanker cars, headed by CSX 39, continues past Marriottsville. 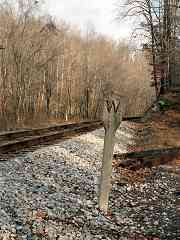 This concrete whistle post is one of only a few such survivors of its vintage along the OML. 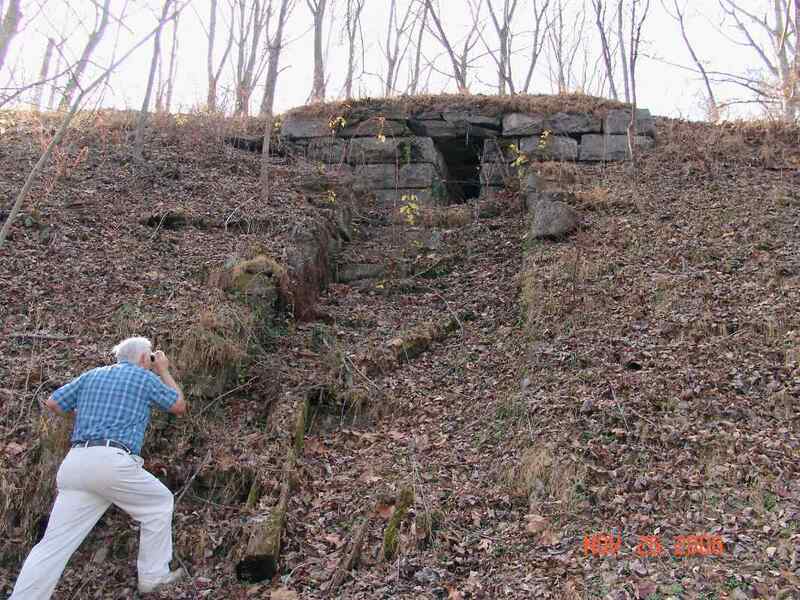 It likely dates to around 1910 and warns of the Marriottsville Road grade crossing just around the bend. Since the time of this photo, it has been removed. 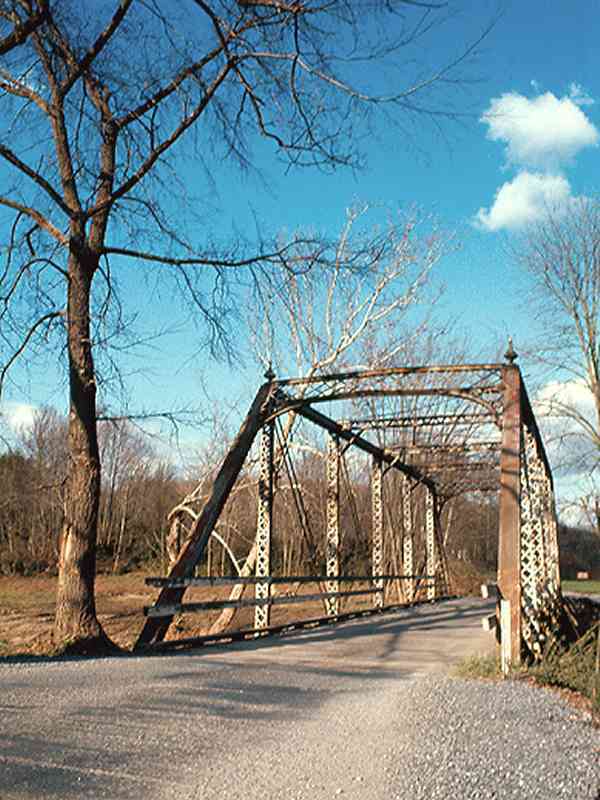 A bridge was first constructed at this site around 1850 to accommodate the OML's re-routing through the Henryton (then Marriottsville) Tunnel hiding in the distance at left. I've read that a Bollman bridge once spanned the Patapsco here, and was washed away in 1868, but there is no evidence of that today. 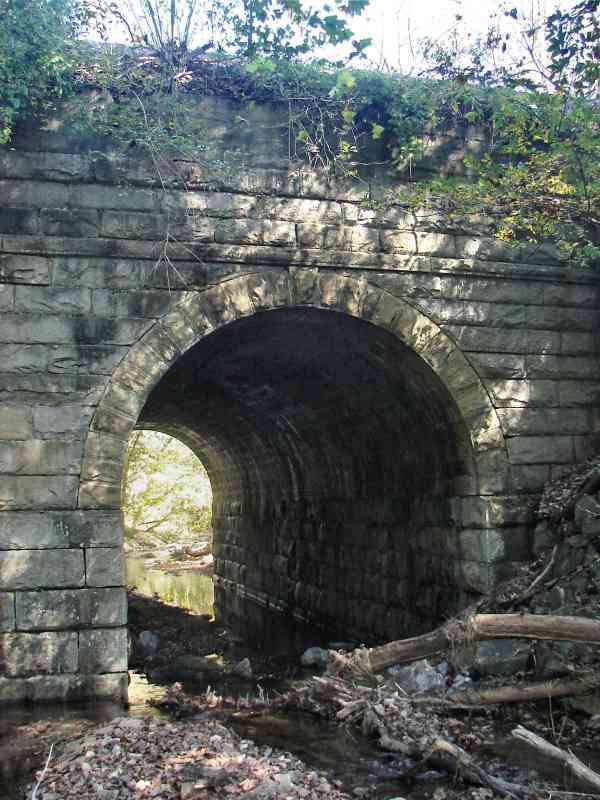 The style of the current bridge indicates a construction date early in the 1900s, probably around the time the nearby tunnel was improved, following by updating later in the 20th century, possibly after the floods of Tropical Storm Agnes. Henryton Tunnel is the third-oldest tunnel in the world that remains in active railroad use. 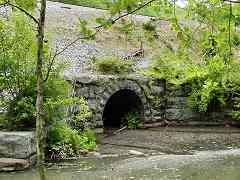 Opened around 1850, it was the first tunnel constructed on the OML. 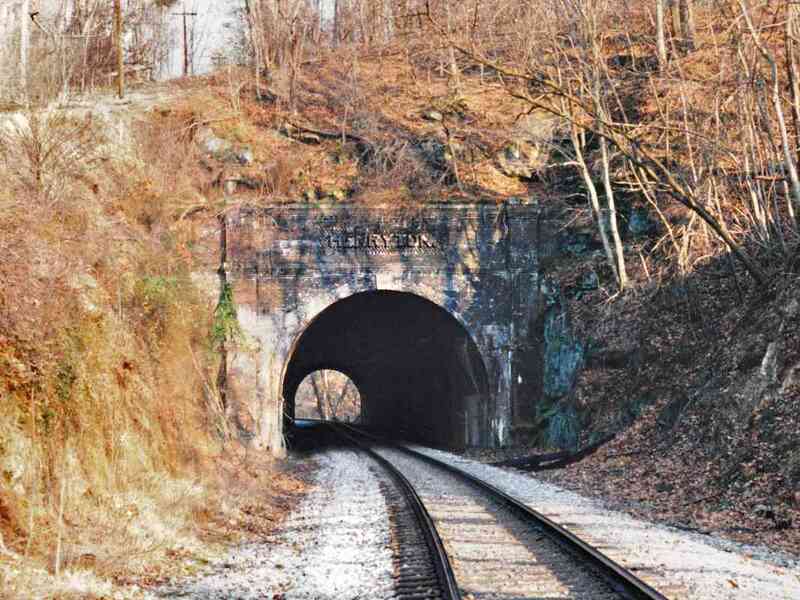 Shortly after the Civil War, the tunnel was widened to double track, and in 1903, rebuilt into the form seen here. 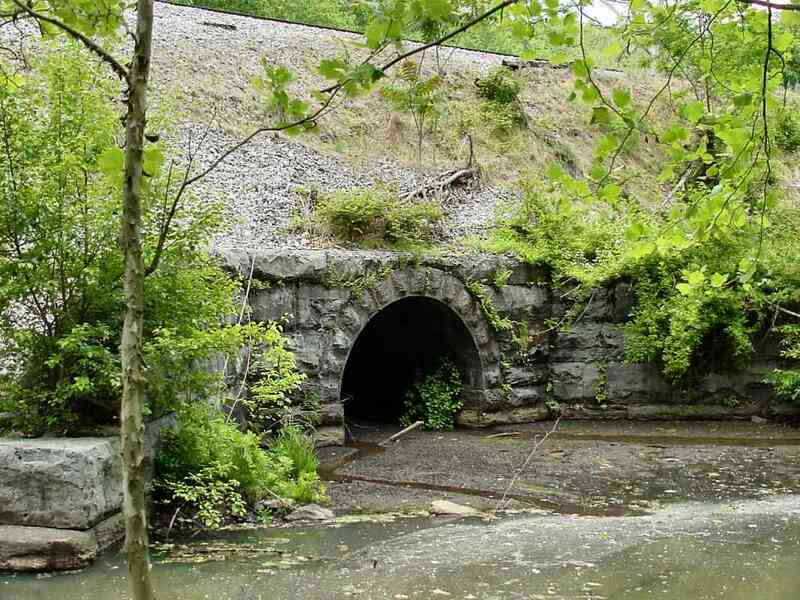 The award for "oldest tunnel still in railroad use" goes to the Taft Tunnel in Lisbon, CT built by the Norwich-Worcester Railroad in 1837. 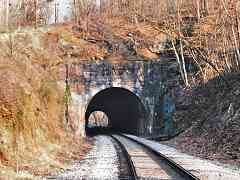 The Howard Tunnel in York County, PA opened in 1840 and still sees an occasional tourist train. 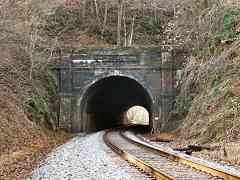 Another view of the tunnel, this time of the west portal. 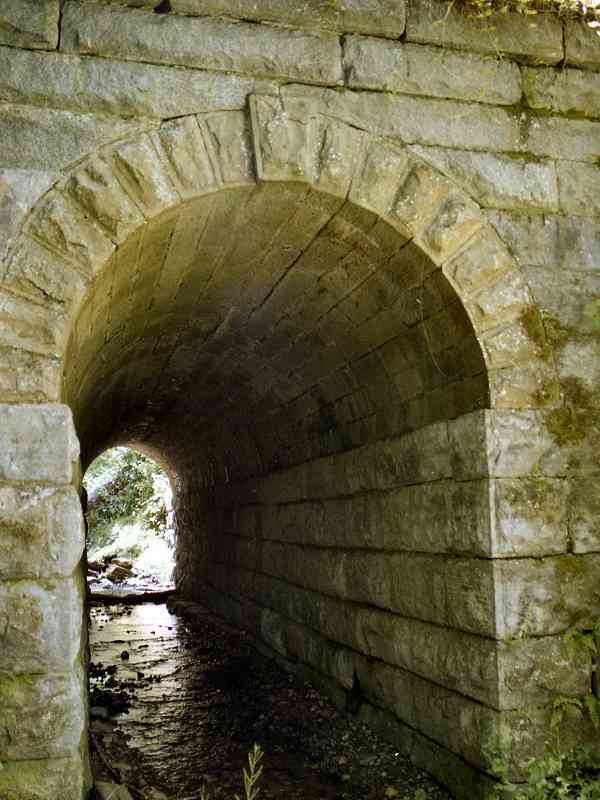 Note that this tunnel is not marked on most editions of the ADC street maps. 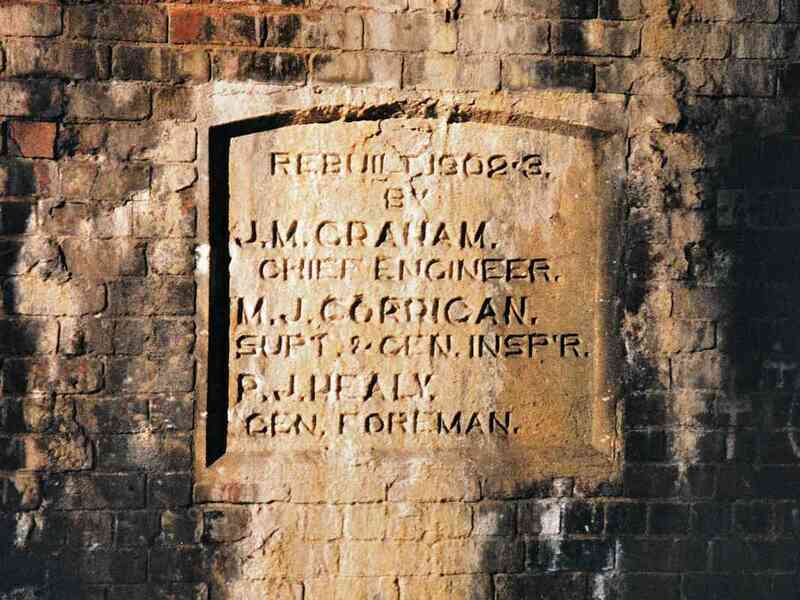 This plaque, which can be found near the west portal of the Henryton Tunnel, documents the date of reconstruction. 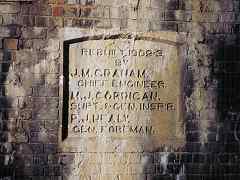 A similar plaque can be found in the Sykesville Tunnel. 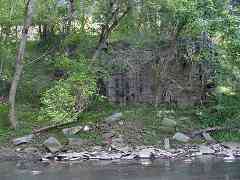 Just west of the tunnel is where you'll find Henryton State Hospital, or what remains of it. Sadly, repeated vandalism led to most of the structures being demolished by government authorities during 2013. 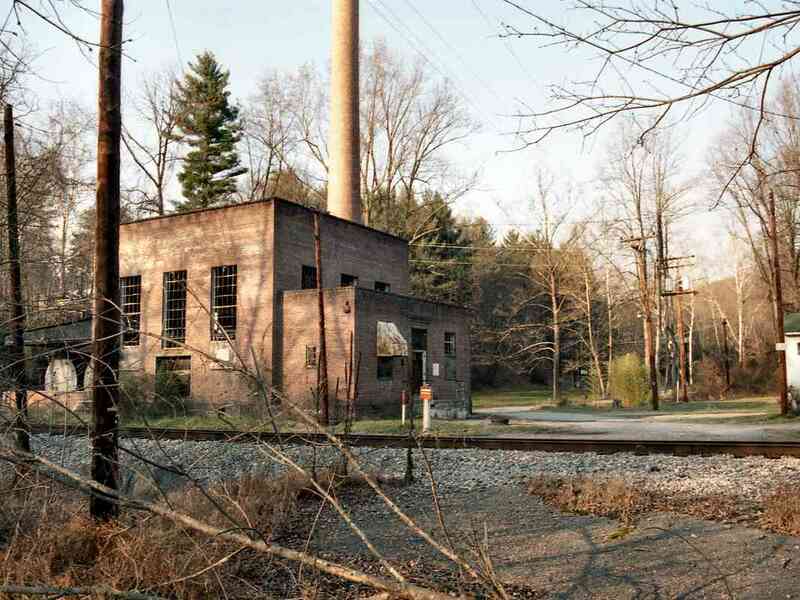 This facility is smack dab in one of the most isolated sections of Patapsco Valley State Park. Henryton Road used to cross the river and railroad here, but the bridge washed out (I'd estimate 1972 in Tropical Storm Agnes) and was never rebuilt. "I think I can shed some light on the Henry Hospital Center mystery. It was established in 1922 as a tuberculosis sanitorium and was converted to a center for the mentally retarded in 1963, finally closing in 1985. "However, either at the same location or in the same area, there is now operating the Thomas O'Farrell Youth Center, targeted at male adolescent 'Substance Abusers, Drug Dealers, Weapon Carriers, [and] Property Offenders'. The address is given as being on Henryton Road proper, which according to the current ADC maps is not the road that runs down to the river, but the one that runs parallel to it. If you look at the ADC map, the are two holes cut out of the state park area. The larger is clearly the old hospital; the smaller one, on the north side of the road, would appear to be this treatment center. Obviously this is the sort of place that is going to make the police jittery." 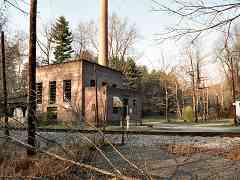 "The boiler house is the building next to the tracks. You can still See the old pipes that went up to the hospital. Next to the boiler house used to be green houses. "The old road crossing signals remained way after Henryton Road was closed after (Tropical Storm) Agnes, they did close the road. The bridge remained until about four or five years ago (1995). [Note from Steve: the remaining pavement looks to me like it was disused many years before 1995.] It was in bad shape - the same kind of bridge was also used on Marriottsville Road until about 83-84? I did take pictures of that bridge defore it was taken down. What traffic jams when the train came and the everybody needed to cross the old one lane bridge! I understand the old Genstar Rock Co. used to pay for repairs to keep the bridge up to par, because of the dump trucks that used it. "Did you know about the old siding in Marriottsville? It was near the RR signals and used to store MoW equipment. Before welded rail was installed, I saw a derailment caused by the switch track and rocking cars. "Agnes did a number on the OML. Did you know the state wanted to buy the line after Agnes and turn it into a trail for walking and biking?"